Actually am looking for Akash Tablet…Where can i get it??? Really? I heard it has quite a few problems. Better to wait for Aakash 2 I think. The Kindle Buyer Booster definitely seems like a very good and useful solution, Derek. This is really an amazing. I love my Kindle and especially the opportunity to by books so easily in my native language. I have friends that are working on project making an income with Kindle books. I introduced them your blog and shared this post with them. Sure thing…I will shoot you an email in a minute! I have been waiting to buy a tablet but have found that the kindle fire is just what I want with all the options I need. Thanks for the advise i will go and check out the link and see what I can do to help myself out. Please let me know if you’re looking for a article author for your site. You have some really good articles and I believe I would be a good asset. If you ever want to take some of the load off, I’d love to write some material for your blog in exchange for a link back to mine. Please shoot me an e-mail if interested. Regards! I see that you got a lot of great feedback Derek! Hope you will generate lots of sales. Thanks Samantha! It has been doing great so far, much better than I had anticipated. The kindle really has changed the way digital products are used. They have become so easy to access and have almost become commonplace in our lives. Taking full advantage of that is a no brainer. This WSO is a must have for sure. I think it is novice and unique step in internet marketing. I welcome this. I just got my Kindle Fire the other day and I love it, i also suggested your book , to some friends of mine who are new dads. Thanks for the recommendation of my book! Good to know about the Fire, I’ve been thinking of getting one for my wife…the price is much more reasonable than an iPad and for her purposes I am sure it would be fine. I dont have any idea about this Maybe I should buy..
My wife loves her Kindle. Great package as well. The Kindle is fantastic. I opted for the bare-bones $79 version. I wante d to keep the reading experience as close to a book as possible. I really don’t want a keyboard, or full color and ability to watch movies on it….just to read. Not exactly up my alley… But I’m debating about picking this up. In your opinion, the ebook affiliate marketing isn’t yet saturated? Seems like a lot of people jumped on the bandwagon! Anyway, awesome that you got yet another product out the door. STOP making me feel like a bum! I know what you mean – there’s a lot out there on selling books for Kindles, but the trick is to do it better than the masses and this could help. Its give me some tips that will help me to make my work easier and simpler! This is really awesome. Great to get to know about this new product info. Thanks for announcing. This must be great work coming from you. Small world indeed, as I spent my college days in Bloomington at IWU. Thanks for stopping by and saying hello Charles! I am using a kindle which works awesome. Thanks for your post Derek. Hi Derek, Probably not the item for me (Kindle), but well done on getting your second book out there, I wish you every success during these tough times. I never try to use kindle but my friend told me that using this tool is really nice.. I agree that this kindle really is a great tool and very convenient to use..I really love to have one also..
Good stuff, Derek. 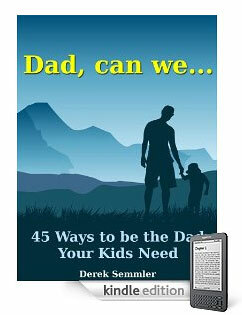 Congrats on “Dad, Can We”. Your info is always interesting to a new blogger/ writer like me. Kindle is great tool. Since I buy it in May last year I’v red houndreds of books. Also Amazon has great customer policy. Being new into the tablet world, I going to have to check this out. Thanks. I need to check out more on the background of the tool and how it is used to market books. From the users side I still prefer reading real books as my eyes need a break from the screen each day. Congrats for launching your new info product. I couldn’t agree more about the hotness of the kindle market and I believe it’s one of the best product I’ve ever purchased. Will definitely check out your book. Will head over to WF and check out your Kindle buyer booster. This is a very interesting article. Hey what did you use to convert your book into kindle? I think the kindle is still the best reader out there. Bought your Kindle Buyer Booster immediately, I’m putting romances up on Kindle and struggling with getting reviews. Great idea, but one big problem–you have to have email addresses of people with Kindles to use your idea. Any thoughts on how to go about getting those folks? My friends and relatives just don’t Kindle. I headed over to WF and checked out your product, too. From the many positive reviews, it seems a solid one. Would love to write a kindle book soon. Kindle buyer booster is one of the best things that came up for the kindle seller. Not only it helps to optimize their kindle book and drive traffics but it also give more chances for those who are new in selling kindle eboks. I am looking to write a Kindle book. Just saw your product on the Warrior Forum. Can’t wait to get started!